I was thankful to have the opportunity to chair the Agriculture, Water, Trade and Economic Development Committee meeting on Tuesday where we received testimony on bills related to the state Supreme Court’s recent Hirst decision. Sometimes decisions made in Washington, D.C. can affect things here in Olympia. This week, though, brought an example that is not seen often. Since 2013, Brian Dansel was the state senator who represented the portion of Okanogan County in the 7th Legislative District, adjacent to our 12th District. On Tuesday, he stepped down to accept a position as special assistant to the new U.S. secretary of agriculture in the Trump administration. The Republican precinct committee officers and county commissioners in the 7th (from Ferry, Stevens, Pend Oreille and Spokane counties, in addition to Okanogan) are working to appoint a new senator soon. In the meantime, the task of leading the Senate Local Government Committee can be handled by the vice chair – the same way that I led this week’s meeting of the Senate Agriculture, Water, Trade and Economic Development Committee. My former colleague’s move to the other Washington affects more than the committee he chaired. The Senate is in a 24-24 tie until the vacant seat is filled. While this might be a temporary challenge for the Senate, it can only be good for our part of the state that someone who understands tree fruit and wheat and timber will be able to put that knowledge to work for the new federal administration. We are nearing the end of the third week of this legislative session. All the e-mails, letters, telephone calls and personal visits have kept me and my hardworking staff very busy -- and I wouldn’t want it any other way. The more you ask questions and share concerns, the better I can represent you as we get closer to moving bills out of committees and bringing them to votes. 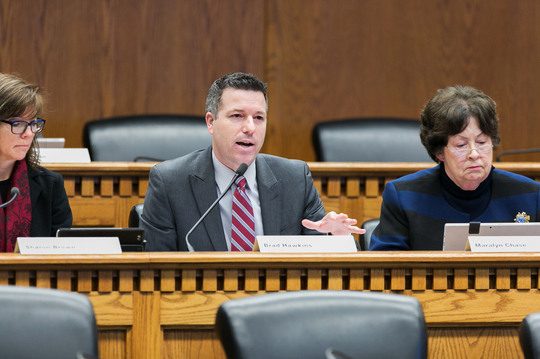 Sen. Judy Warnick of Moses Lake was out sick Tuesday morning, so the job of conducting the Senate Agriculture, Water, Trade and Economic Development Committee meeting went to me as vice chair. Having been chair of the Eastmont school board, I am comfortable leading public meetings – except at Eastmont we didn’t need a green-yellow-red light to limit public testimony to two minutes per person. Legislative committees often do that when many people sign in to speak about a bill. The committee needed the signal light Tuesday morning because we were having a public hearing on two bills related to water availability, and that brought a large audience to the hearing room. We also took testimony using a remote video hookup with a location in Spokane, which saved people from the long drive to Olympia. I am especially sensitive to the difficulty of traveling to Olympia at this time of year and welcome the use of technology to allow more voices to be heard. Senate Bill 5239, sponsored by Senator Warnick, and Senate Bill 5024, sponsored by Sen. John McCoy of Tulalip, both respond to an October 2016 ruling from the state Supreme Court known as the Hirst decision. It is named for one of the environmentalists who brought the original lawsuit against Whatcom County. The Hirst case involves “exempt” wells, which withdraw less than 5,000 gallons per day for residential purposes. They often serve as the water supply for residential development in rural areas. It used to be that counties relied on data from the state Department of Ecology when deciding whether water is available to support a building permit. The court ruled that counties must themselves ensure adequate water supplies are available before issuing permits that would rely on an exempt well. My job during Tuesday’s hearing was to make sure both bills received a fair hearing. It took nearly two hours, but all who wanted to testify had the opportunity to do so, and I appreciated the discussion. The Hirst decision and the legislative proposals in response were the focus of this week’s interview with KOHO radio. To listen to this interview, please click here. During the past week I added my name to the sponsorship list for eight Senate bills – and have introduced two more measures directly, making me the “prime” sponsor of those bills. The first of my prime-sponsored bills to receive a public hearing is Senate Bill 5270, which will come before our Senate Natural Resources and Parks Committee this afternoon. In an earlier update I mentioned having met with Hilary Franz, the new commissioner of public lands. She heads the state Department of Natural Resources. Because she and other elected officials are in the executive branch, not the legislative branch, they cannot introduce legislation. Instead, they will ask legislators to introduce bills on their behalf, and SB 5270 is an example of what we call “agency request” legislation. DNR operates a contract-harvest program that allows the agency to hire someone to harvest timber and sort the logs, after which DNR can sell them. The program was established in 2003; it was expanded in 2009 on a temporary basis to see if the changes would work as intended. SB 5270 would take off the “temporary” tag, making the program permanent. The chair of the natural-resources committee and the minority leader on the committee are co-sponsors of my bill, so I expect it will move forward from our committee later this month. Also, I have been working closely with stakeholders interested in wildfire issues on another important piece of legislation. I look forward to introducing that bill soon and sharing more information with you in a future update.